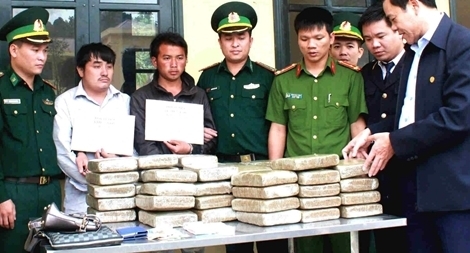 The Anti-drug Unit under the Quang Binh Border Guard Command in coordination with functional forces cracked down on a major drug trafficking case, arresting 4 persons, seizing 110,000 pills of synthetic drugs, 3 cars, 19 million Lao Kip and many exhibits. The Border Guard of the northern mountainous province of Lai Chau has presented 166 scholarships worth a total of 500 million VND (21,500 USD) to poor students in the province’s border localities. PSNews – Senior Lieutenant General Bui Van Nam, Member of the Party Central Committee, Deputy Minister of Public Security on March 2nd led a delegation to visit and congratulate the Command of Border Guard of Vietnam on their traditional day (March 3, 1959). PSNews-On May 2, the Border Guard force of Tay Ninh caught 3 men carrying 21 kg of synthetic drugs from Cambodia to Vietnam. A Philippine national has been saved and delivered to the border guard in the central province of Quang Ngai after his boat sunk at sea.